Colaba Market is situated very close to Nariman house which was used by the terrorists when they attacked Mumbai two years back. Went there last Sunday with two friends for a photo shoot and saw these kids playing in a by lane. It has happened again! I got one more comment from one EyeImage about commenting on 'old' pictures. It seems it's the same person as the words are identical... what's interesting is that the commenting person has used the names of members of Daily community! 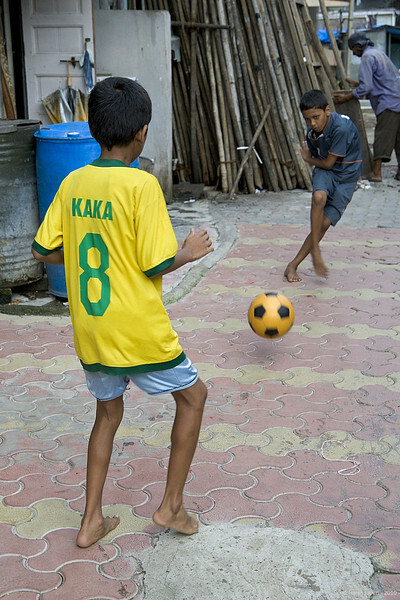 Great street shot showing soccer fever!! Great catch! And ditto everyone else - they nailed it. I run into issues as well sometimes where I just don't have time to comment until later. I love the youthful play you captured here. Wonderful street capture of real life. Harsh, comment when you want and can. I had not seen or heard about this. Sorry you are receiving such harassment too. I enjoy your comments whenever you leave them new or old. I have never seen a rule about not commenting on old shots. Sometimes old shots show up even without new comments. I'd just ignore the 'advice'.